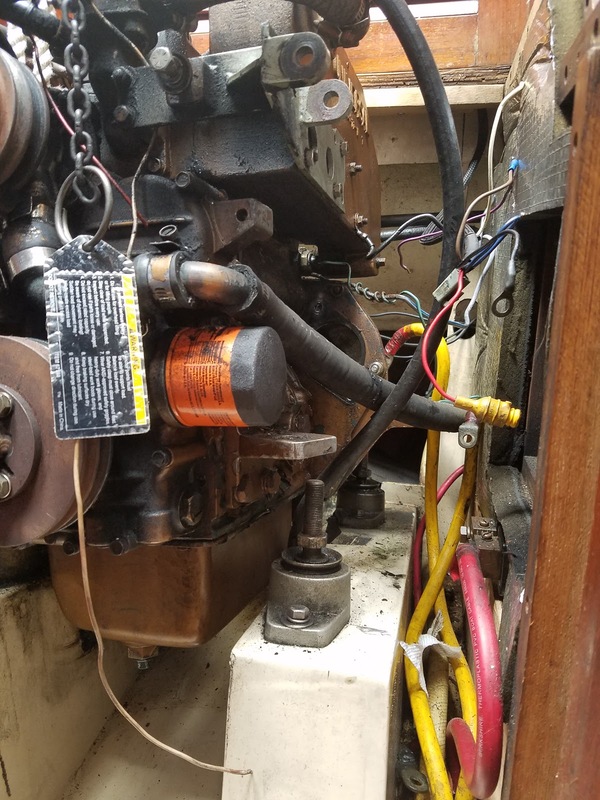 Anyone that has been on our boat knows - We have Vibrations when the Engine runs. The very experienced folks on the C34 Association site have been a huge help in the current projects that are underway on Eximius. 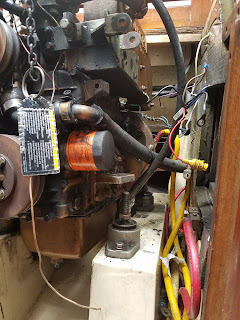 Right now the Engine's Heat Exchanger is out, also the Starter is out and all of the raw water hoses are out and all of the electrical wiring from the Engine Control Panel to the Engine have also been removed for a complete upgrade. So, if I were to replace the Engine Motor Mounts, now would be the time. 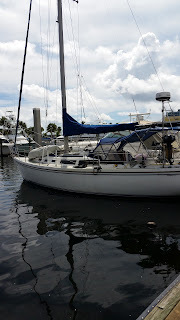 Am I a glutton for boat projects? Seems like it. The new mounts arrived so I planned to go down to the boat today to see if I could make progress on their install. I used a dial caliper to measure the height of each of the engine corner plates that the existing motor mounts rest on. Plan was to use these as a starting point when realigning the Engine to the Prop Shaft. Step 2: Disconnect the Prop Shaft from the back of the gearbox. This was a bit awkward, but that's all. The four bolts were easy to get out once their grip was freed. My neighbor John came down to the boat with me, and having two people significantly reduced the time to get this done, maybe 15 minutes. Step 3: Remove the nuts that hold the Engine down onto the existing motor mounts. Again, no big deal, neither of us skinned any knuckles. 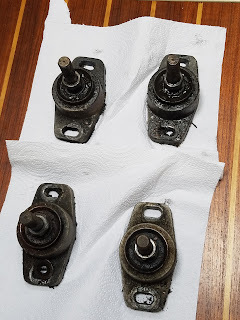 Once the nuts (15/16") were released, it was easy to spin them off, of course, there was a bit of grot on the top end of the long motor mount bolt, but a quick wipe down cleaned up enough to allow the nuts to be spun off. Nuts and washers put aside, they won't be used on the new Mounts. Step 4: Hoist the Engine off of the Motor Mounts. I had purchased a 1/4 Ton lever chain hoist from Harbor Freight. Neat little hoist. A 4' piece of 4x4 across the top of the cabin entrance, a 1/2" 3 ply line tied with a clove hitch and then the end tied back around the loops to prevent a load from just rotating the 4x4. Hoisting the Engine was a breeze! I can recommend that hoist for the job. Step 5: Remove the old motor mounts. Each is held in place with a fore and aft Lag Bolt that is screwed into the fiber glass covered wooden engine stringers.. The forward most two (port and stbd) were easy to get out, so too were the aft most on each side, but the 4 bolts that were nearest to the center of the engine were not so easy, at least until I just spun the old mounts by 180 degrees, then it was eazy peezee getting them out. 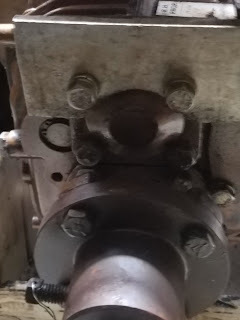 I cannot figure why some of the bolts are nearly 4" long and some only 2" long, they were not in any particular order. Step 6: Clean up the stringers. I have no clue how long it has been since the Engine was pulled prior our ownership, but if the grot on the top of the stringers is any clue, then it may be never! If I had removed the Engine entirely, then I would take the trouble to sand down the stringers and respray them so that they look good. As it is I used half a roll of paper towel, several soapy wipes and a spray of boat soap. It barely made a difference except that when I ran my hand along the stringers, they came out comparatively clean. Step 7: Install the new mounts. First snag! Bummer! The mounting holes of the new mounts do not match those on the old mounts! So I'll have to re-drill the holes! I needed to figure out which holes needed to be redrilled. Each new mount has two holes and they are about 1/8" closer together than the original mounts. I installed the mounts using only the aft lag bolts and lowered the engine. Then adjusted the nuts on the mounts to match the height that I measured in step 1. Lowering the Engine using the Hoist was as easy as raising it! A little bit of pull and shove and the Engine was sitting neatly on the 4 mounting bolts. 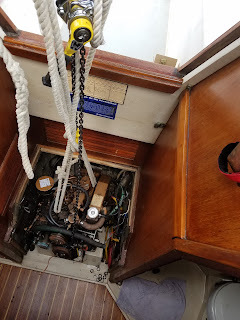 A check of the prop shaft to gearbox connecting flanges showed that I needed to move the Engine aft about a a few thou. A shove with my foot on the large belt pulley on the front of the Engine and the movement was enough to get the alignment much closer. Step 8: Re-drill the Mounting holes. So, Friday should be productive and I should be able to get the Engine correctly mounted on the newly installed motor mounts. Then it's back to the Electrical Harness and Engine Exhaust Riser upgrades. Gotta love doing this stuff.